For The Cloverfield Paradox (previously titled God Particle), producer J.J. Abrams has released another surprisingly anticipated effort in his pieced together Cloverfield universe series of ever so loosely tied together—at least until now—sci-fi genre features. Here, director Julius Onah unfortunately crafts an entirely derivative and nonsensical futuristic space station movie just barely assembled enough to be clunkily retrofitted into the monster movie franchise's confusing continuity. 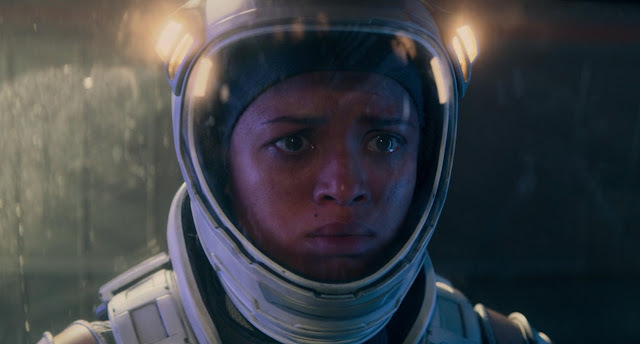 Starring primarily Gugu Mbatha-Raw, Daniel Brühl, David Oyelowo, and Elizabeth Debicki as a group of mysterious scientists and astronauts in outer space, the crew is looking to solve an energy crisis through a never explained particle accelerator machine too dangerous to be executed on Earth. The very talented cast of mostly international character actors is impressive but maddening. Unfortunately, the likes of Chris O'Dowd, John Ortiz, Aksel Hennie, and Zhang Ziyi are vastly underutilized as awkward exposition devices to a plot that is absolute nonsense. From a script written by Oren Uziel, it's clear the half-baked premise with equal parts Life, Sunshine, Event Horizon, and many other films in the sci-fi spaceship genre was retrofitted during and after production to awkwardly place it squarely in the middle of Cloverfield's very loose and entirely muddled universe of inter-dimensional connected genre stories. Had anyone outside of Abrams and his Bad Robot production label produced this, the inanely titled The Cloverfield Paradox would have been merely dumped to home video without much fanfare. Its surprise release and slapped-on Cloverfield label made it at least an intriguing possible experiment that frankly isn't worth its hype. The Cloverfield Station is available for streaming on Netflix.